The“12 Habits of Highly Healthy People” program has kicked off for 2015! We are making the commitment to your personal health! Over the course of the next year, you will be introduced to 12 healthy habits that can help you gradually incorporate into your life. This month, “Portion Sizes” is the focus for Habit 3. Healthy eating encompasses not only what is eaten but also how much is eaten. Portion sizes can be influenced by the size of the plate, bowl or even the glass used. To stay on track with the amount consumed, consider using a smaller 9” plate. 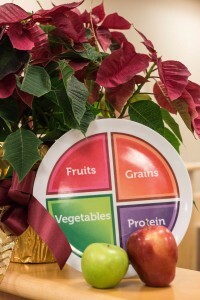 Then aim to fill half your plate with low energy dense foods like fruits and vegetables. Lastly, slow down when you eat. Consider setting the fork down between bites to help you savor every bite. These tips will keep portions in check while keeping meals satisfying. -Kristen Perrizo, RDN, L.D., is a Clinical Dietitian in the Division of Endocrinology and at the Dan Abraham Healthy Living Center. -Sue Cutshall, R.N., C.N.S., is an Integrative Health Specialist in the Department of General Internal Medicine Complementary and Integrative Medicine Program. March is National Nutrition Month®. Look for nutrition related displays in the cafeterias, including cooking demos. Check out the DAHLC nutrition classes offered to members in March. See webpage for more details. To register, call 266-4688 or sign up at DAHLC front desk. Even if you’re not aiming to lose weight, the Mayo Clinic Diet has practical tools to help improve your overall eating habits.